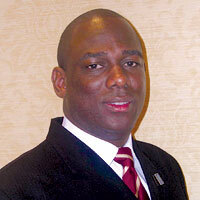 Politics is Rickford Burke?s passion. Born into a political family in Guyana, the self-described ?Caribbean integrationist and internationalist? is a staunch advocate for the empowerment of New York?s Caribbean-American community. As current president of the Caribbean-Guyana Institute of Democracy, a think tank that promotes more favorable U.S. policies toward the Caribbean region, he has become a respected voice in the Caribbean-American community throughout the United States. In his tenure, the institute established the prestigious Democracy Prize, awarded annually to a Caribbean head of state. At 16, Burke joined the Guyana Youth and Student Movement and quickly moved up to become its president, earning direct access to the country?s political leaders and national recognition as an emerging political leader. He also acquired the proficiency that helped him attain his current position as a political adviser to Councilman David Yassky, a leading figure in New York City politics. Burke, 34, holds a master?s and a law degree from NYU Law School in New York. He once served as vice president of Saxon National Bank, as northeast area manager for vehicle, sales, service and marketing at General Motors Corp. and as a consultant on international law and consular affairs for New Jersey?s Office of the Public Defender. He is active in business, political and community organizations, including St. Gabriel?s Senior Center, the Caribbean American Chamber of Commerce and Industry and the Progressive Democratic Political Association. He also provides commentary to WWRL, WLIB and other media entities on U.S. foreign policy and Caribbean and international affairs. In his spare time, Burke plays pool and tennis and collects antiques. He loves to travel, he says, and enjoys basketball and cricket. ?I can do all things through Christ who strengthens me,? he declares, quoting the biblical passage. Burke attributes his professional achievements to the former president of Guyana, the late Hugh Desmond Hoyte, but acknowledges the leadership skills he developed while working with New York politicos, including former City Council member Una Clarke, Gov. George Pataki and David Yassky.